Today everyone wants a beautiful smile. When a person feels and looks good, they have a strong self image. People who feel good about themselves interact positively with family, friends and business contacts. Advances in modern dentistry make it easy to restore a life-like beauty to teeth that are stained, chipped, crooked, missing or separated by a wide spaces. Thanks to improved technology and materials, Dr. Grant can now skillfully and quickly change those crowded, crooked and missing teeth into beautiful smiles. Cosmetic dentistry is no longer just for the front teeth. Those old silver fillings that have made your back teeth dark and unattractive can now be replaced with state-of-the-art materials that will make your teeth stronger, healthier and much more attractive. 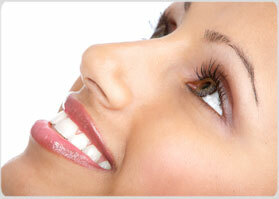 Veneers – thin custom-made shells that are designed to cover the front side of teeth. Made of tooth-colored materials, veneers are used to treat spaces between teeth, and to treat teeth that are permanently stained, poorly shaped or slightly crooked. They may also cover teeth that are chipped or worn. Tooth Whitening – also called bleaching – is a procedure that brightens teeth that are discolored, stained, or have been darkened because of injury. It can be performed on living teeth or teeth that have had root canal treatment. Bonding – a cosmetic procedure that can improve the appearance of teeth that are chipped, broken, cracked, stained, or have spaces between them. With bonding, tooth-colored materials are attached, or bonded, to a tooth surface to correct a defect or mask unsightly appearances. Bonding also is used to protect exposed tooth roots that result from gum recession and to fill small cavities. Porcelain Crowns – Dental porcelain can be sculpted to closely replicate the look of natural tooth enamel, while providing desirable strength and resilience. Porcelain crowns are an excellent choice when recreating the form and function of a damaged tooth, because a crown basically replaces the entire external portion of the tooth down to the gum level. Crowns are not limited to simply replacing the original tooth, but can be designed to create an even better esthetic appearance. Enamel Shaping – a process of shaping, or contouring natural teeth to improve their overall appearance. When teeth are slightly crowded or uneven, or when teeth appear too long, enamel shaping may be used to correct the flaw. These treatments and others can help you have more natural looking and attractive teeth.